Look, when runDisney races sell out within a day, I can get over it. When they DON'T and then hover at 98% full for WEEKS, I can't take it. I succumb. 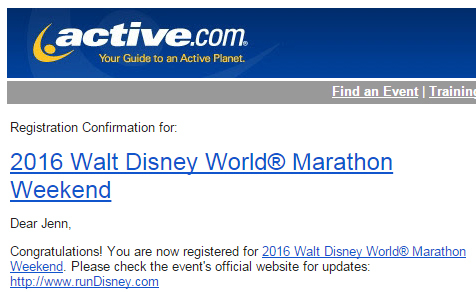 I'm registered for the 2016 WDW Marathon. This is gonna be a weird one - to save money, I plan to fly in on Saturday morning, get my packet, run the race, and fly home. No parks - I'm gonna check out Disney Springs on Saturday evening and then maybe do a monorail bar crawl after the marathon or alternatively just plant myself in Trader Sam's (additional participants welcome if you're there and bored!). It's gonna take a little more orchestration than usual (bag storage, late check-out extension for much-needed showering privileges, etc.) but I REGRET NOTHING. EXPEDITION EVEREST MID-RACE OR BUST! Who else will be there?! Has anyone ever managed to register this late for a runDisney race? I'm not gonna be in the last corral, am I?! HAHA, YES! I'm going to need to pick my meals CAREFULLY.